A better camera and personalized emojis might headline the new features on Samsung's Galaxy S9, but there's are good reasons for enterprise users to take notice: a new version of its innovative DeX dock and upgrades to Knox. DeX was introduced with the Galaxy S8 last year and connects to a monitor, keyboard and mouse for a PC-like experience powered by the smartphone. Software in the phone detects when it's connected and replaces the typical smartphone homescreen with a computer-like desktop on the monitor. The idea is that business travelers can leave the PC at home and compatible apps include Microsoft Office, Gmail and Adobe Lightroom. In the new DeX the smartphone lies down horizontally instead of sitting up. That means the screen can be used as a touchpad so users don't need to pack a mouse. In a demonstration it appeared to work well. 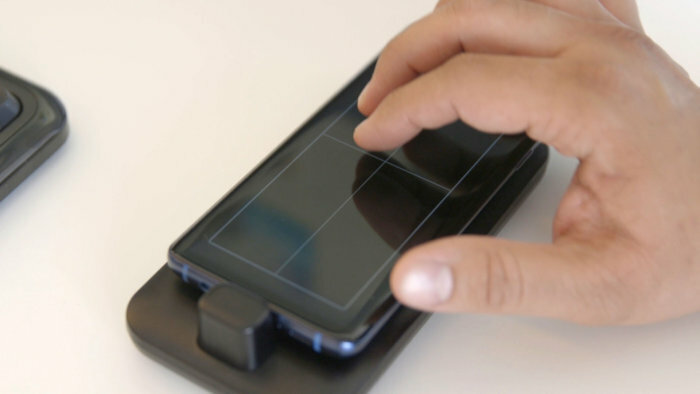 A phone screen turns into a track pad with the new version of Dex. Samsung said it plans to add a toggle for an on-screen keyboard so even a keyboard can be left at home, but that wasn't working in the demo and might be a harder sell. The phone slides onto the Dex dock and connects to a USB-C plug. On the bottom are two USB-A, a USB-C and an HDMI connector. The dock can charge the phone if connected to power but otherwise doesn't require power. The Dex dock includes 2 conventional USB sockets, an HDMI and a USB-C connector. 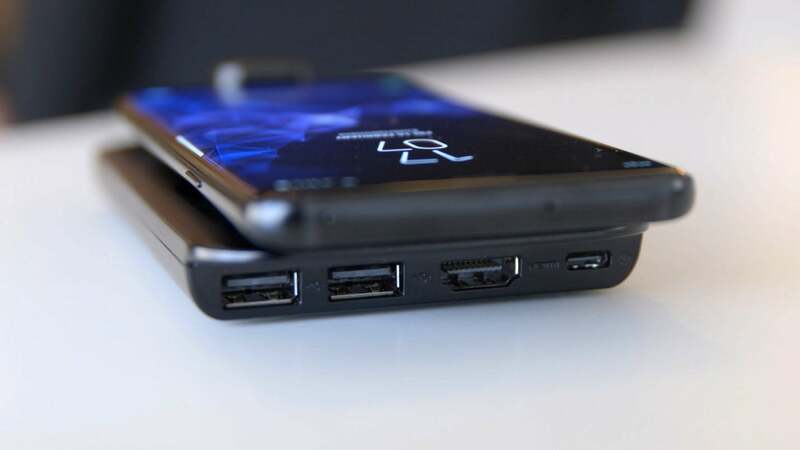 Another bonus of the new dock is that the audio socket on the phone is now accessible when the phone is docked so a headset can be connected. Screen-resolution is also getting an upgrade. The previous version output a high-definition (1920 x 1080) video image while the new version ups that to 2560 x 1440 pixels, so users have more screen real-estate. 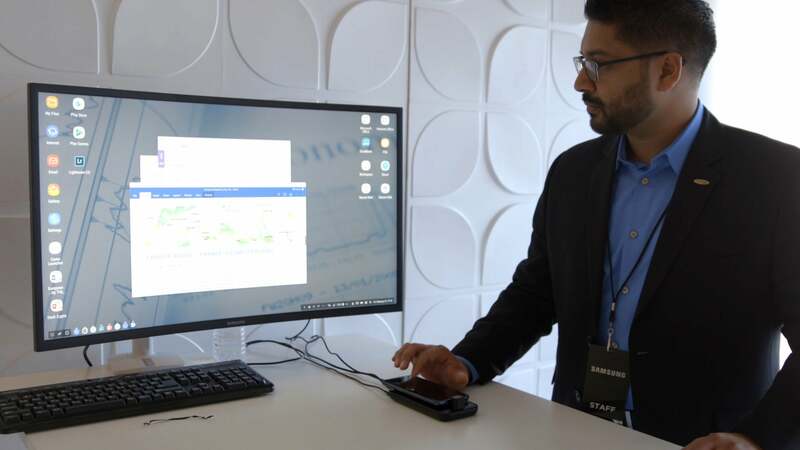 Samsung Dex in use during a demonstration in San Francisco. It's not just business travelers that are taking notice of Dex. Samsung said it's testing the system out in police cars as a smartphone with Dex could replace the current in-car computers. The new Dex is compatible with Android Oreo, the latest version of Android that's shipping in the S9. The S8 and Note 8, both of which work with the previous version of Dex, haven't been given the Oreo update yet. Also of interest to enterprise users will be a new version of Samsung's Knox security platform. There's a new biometric verification method called "intelligent scan" that is said to fuse iris scanning and facial recognition and a new feature called "dedicated fingerprint" that provides the option to specify a different fingerprint to gain access to the secure folder than the one used to unlock the phone. The Enterprise Edition of the phone, available from Samsung and channel partners, also packs Knox Configure, which allows remote provisioning and configuration of mobile devices with granular control of many settings. Enterprise customers can also send new firmware to phones on their schedule rather than that of a carrier. 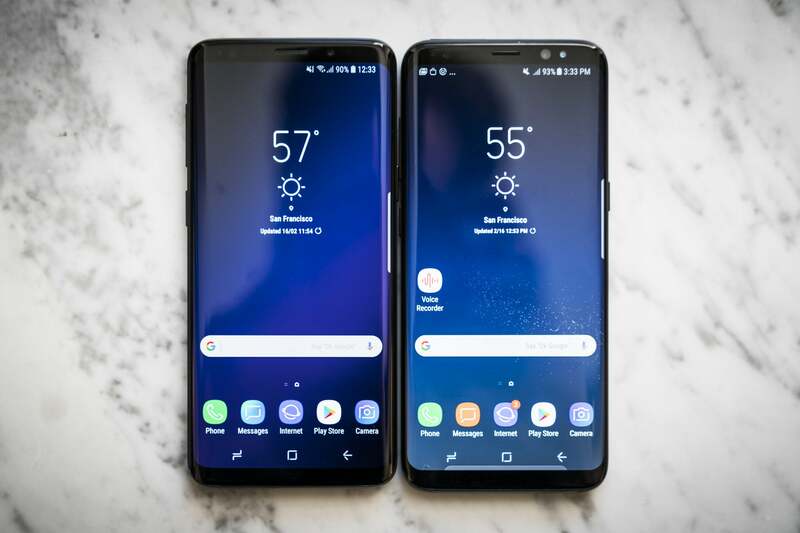 The Galaxy S9 (left) is a smidgen shorter top to bottom than the Galaxy S8 (right). But dsiplay size remains static at 5.8 inches. The Galaxy S9 is an evolutionary update of Samsung's current S9 and Note 8 smartphones. The S9 has a 5.8-inch screen, 12-megapixel rear camera and 8-megapixel front camera while the S9+ has a 6.2-inch screen, dual 12-megapixel rear cameras and 8-megapixel front camera. With those dual cameras, the S9+ becomes the second phone from Samsung to feature two rear cameras after the Note 8. One camera has a wide-angle lens and the other a conventional lens. A new imaging chip behind the camera integrates DRAM so it can capture bursts of images in fast succession: at 960 frames per second. When played back at 60 frames per second, you get a super slow-motion effect. Samsung's Bixby digital assistant is getting an update and can now do live translation with the camera. Just point it at a sign or letter or menu and it will attempt to translate it.